As a result of architecting a new foundation for marketing reporting and re-orienting its organization towards scaling revenue, Fuze won the SiriusDecisions Return on Integration award for Demand Creation. The implementation of Full Circle Insights was key to the company’s success through new visibility into business performance and insights that continue to drive decision-making in marketing and sales. Fuze, a high-growth company that had quadrupled in size in a single year, was facing an inflection point where it needed to scale its sales and marketing. The marketing team needed performance reporting and an understanding of how marketing activities impacted revenue. On the sales side, Fuze’s large lead queue required better management to ensure thorough lead follow-up and efficient utilization of its business development reps (BDRs). Emily Ketchum, Senior Manager of Global Marketing Operations at Fuze, knew of Full Circle Insights since she was a user at a previous company. She and her team chose Full Circle Insights since the solution was a native application in Salesforce, could enable a single source of truth for performance reporting and lead tracking, and had the ability to show marketing contribution to sales pipeline. 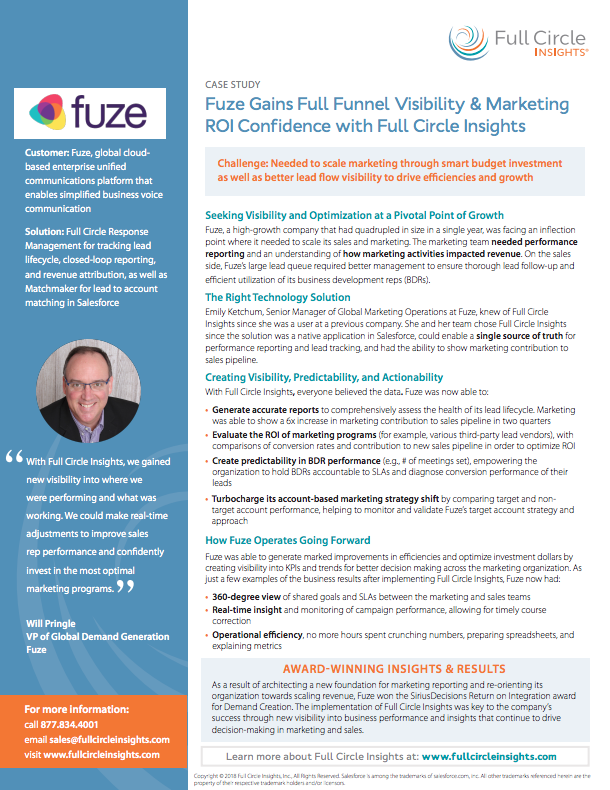 Download the full Fuze Case Study to better understand how implementing Full Circle led Fuze to win the SiriusDecisions Return on Integration award for Demand Creation.